NY plans tourist train upgrade and new trail in Adirondacks - New York state regulators are proposing to extend a tourist train route on the southwestern part of a 119-mile rail corridor through the heart of the Adirondacks, and convert the rest to a 34-mile multi-use recreational trail ending at Lake Placid. New York state regulators are proposing to extend a tourist train route on the southwestern part of a 119-mile rail corridor through the heart of the Adirondacks, and convert the rest to a 34-mile multi-use recreational trail ending at Lake Placid. The plan announced Thursday by the state Department of Environmental Conservation and Department of Transportation formalizes a proposal the agencies discussed at public meetings last fall. An historic rail line from Utica through the Adirondacks to Lake Placid will be partially converted to a bike path/snowmobile trail as part of a plan by the state Departments of Transportation and Environmental Conservation today. Rails used by a tourist train would remain in place to Tupper Lake, where a mega-resort is being planned, but be removed from Tupper Lake to Lake Placid, so the rail bed could be turned into the new multi-use path. This would end the use of the tourist train from Lake Placid to Saranac Lake. The press-release is posted at that link -- It says the DEC and DOT will accept written public comments until close of business July 27. We should all email comments to adirondackpark@dec.ny.gov making it clear that a trail could be built in parallel with the rail line, and that the latter should not be ripped up. I strongly oppose removing the railroad between the Village of Tupper Lake and the Village of Lake Placid. If it is necessary to establish a multiple-use recreational trail along that route, this can be done in parallel to upgrading the existing railway. Keeping the railway intact and improving it to Lake Placid makes the area accessible to elderly and infirm individuals who are not able to make use of a train. Consider the ADA; an accessible train would be beneficial to those unable to use a trail. Please also consider that a train along the full route makes the area more marketable to potential tourists such as myself who would be more likely to visit and spend money in the area if a scenic train was running. There are already plenty of trails in the area. If another one is necessary, develop it in parallel with restoring the entire length of the railroad. Just for the record, and so that you all get it straight. The entire corridor - end to end - with all the track, structures, etc- is on the State Register of Historic Places, and has been since 1993. "What are the results of listing? Registered properties and properties determined eligible for the Registers receive a measure of protection from the effects of federal and/or state agency sponsored, licensed or assisted projects through a notice, review, and consultation process - See more at: http://nysparks.com/shpo/national-regis ... J7c6P.dpuf"
So, one of the true underlying issues here becomes the purpose and effectiveness of such nomination and acceptance - it's a true challenge to the nature of the entire process. So what I'm taking away from this is that NYDOT will, at a minimum, need to perform the typical Section 106 reviews prior to this actually happening. Or, have they already gone through that process and their determination is that the last 34 miles is not considered significant or contributing to the rest of the district? Does losing the northern end of the corridor impact the significance of the remainder of the historic district to a point that the whole thing could lose that status? I would agree with Randy in that whatever comes of this in the end will impact future nominations and undermines the entire process. It's not like this is the first time that state and local governments have decided that historic register items are disposable. However, this appears to be the first time that they are deciding that an existing semi-serviceable railroad corridor is insignificant enough to throw it into a scrap dumpster instead of recognizing its significance to the greater history of the region it serves. Am I the only one who is not seeing this as entirely bad? • Developing a community connector snowmobile system both within and outside of the Corridor which will attract additional snowmobilers to the Adirondacks and Adirondack communities. Under the proposal, DOT will also seek to provide a long-term lease for operation of the train service, allowing the train service to make long-term financial investment in the Corridor." So they rip up 34 miles of track, but rehabilitate 85 miles and then find a long term operator for that 85 miles. I don't know about any of you, but 85 miles of rehabbed track that the owner wants to become a tourist railroad is nothing to sneeze about. I think that giving up the 34 miles to improve the other 85 sounds like a reasonable compromise. Too much opposition and the next proposal may be 119 miles of trail! Ah, yes, but it also exposes the entire 119 miles to no protection whatsoever from National Register status in the future, and sets a rather disturbing precedent for anything that's on the Register, even outside of NY. Remember there's more out there than you think on the National Register, because to be able to be eligible for TEA-21, MAP-21, any kind of enhancement money, whatever it is has to be at least eligible for being on the appropriate state Register, or already on it. There's a lot of equipment and many historic railroads on that designation. Many people have dogs in this fight given this situation. Operating the railroad as an historic attraction is no protection, they are operating out of Lake Placid today. Remember they are operating up to Big Moose now, and Saranac to Lake Placid. It's Big Moose to Saranac that was exempt track for equipment moves only to the east end. My current understanding is that a new 106 review was not going to be started UNTIL this plan was revealed, but I could be wrong on that one. There's lots of fuzzy language out there on how you mitigate if this happens. If the railroad can work to a compromise they can live with (including an upgrade) that's not a bad thing, but all historic railroads have a stake in how the 106 issues are handled here. I'd very much argue that track is significant. 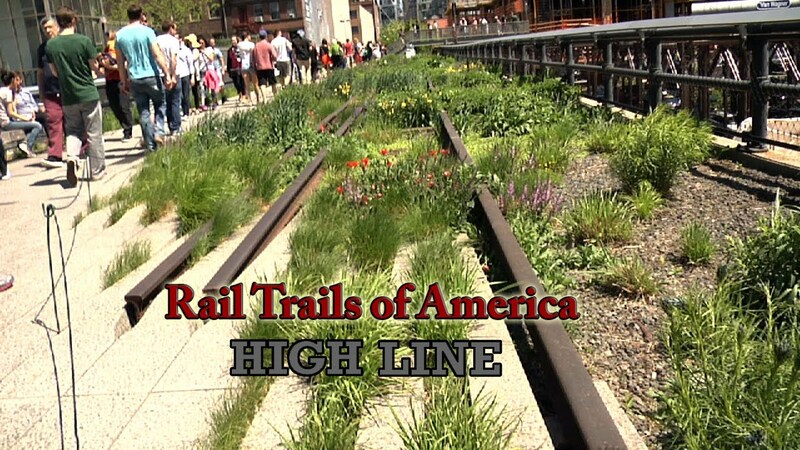 I was rather amused when 'fake track' has been put back down on the High Line trail, even including some switches. What is it with NY State and wanting to rip up the tracks of scenic railroads? First Catskill, now this. In my opinion (for whatever that's worth! ), we are confronted with members in a "movement" (read "fanatics" or even "extremists") who (a) want trails really, really badly, and (b) hate trains. Think I'm overstating the case? How many of the trail crowd complain that trains "spew" smoke and pollution? How many complain about railroads being too "urban" in their rural environments? (I can't help but of Lucius Beebe, who once wrote that a shortline railroad "is a country thing.") How many have made the claim that a railroad is obsolete in a rural corridor like this or in the Catskills? How many have made the claims that bicycles are the "transportation of the future?") (Great in towns, yes, but for a 20 mile ride to town for groceries? Some no doubt do it, but can you imagine how dedicated--"extreme"--such people might be?) How many complain that trains are too noisy, when in reality, a road roars almost all the time? How many trail advocates have been extremely insulting to us rail promoters, telling us we have "blue hair," or that we should go "play with trains in the basement?" How many have accused us of being old fat guys? What about at least one trail promoter who has been caught lying about trail visitation? There is also the possibility we have some people with an agenda--specifically, they make money with trails at our expense. We've had a poster here who has detailed how a "non-profit" trail association has received millions of dollars in grant money over 30 years to "maintain" and "market" the trail they take care of! And there are the people who would try to make money building the trail initially, scrap dealers who think they'll make a mint on the rails, even non-profit "land trusts" that have been documented acquiring land next to a trail that needs to be purchased for access--and guess who forces the sale to a government entity at a nice profit to themselves? What we may have is a small-scale version of the "military-industrial complex" that Dwight Eisenhower warned the country about in 1960. How many of the trail crowd complain that trains "spew" smoke and pollution? Just saying, not that I can think of the legitimate statistics, they (the EPA) say that trains can haul thousands of tons of freight on the same amount of fuel/emissions that a truck can haul one ton of freight. I can't speak for the amount of revenue in upstate New York, but if keeps a few more trucks off the road and a few more trains on 34 miles of track that are doomed to fall at the hands of the modern day city yuppies as we call them in Berks County, why not kill two birds with one stone? The Adirondack Railroad Preservation Society is pleased that a request for an injunction that would have prohibited the Adirondack Scenic Railroad from operating over a section of track near Lake Colby, New York, was denied yesterday morning in Franklin County Supreme Court. The request was made in a lawsuit commenced by the Lake Colby Association. According to its website, Nancy Keet is the President of the Lake Colby Association, and Lee Keet is its Treasurer and a member of the Board of Directors. Attorneys for the Railroad and the Lake Colby Association appeared on June 24 in New York Supreme Court in Malone before Judge Robert G. Main, Jr. The Railroad was represented by Jonathan Fellows of Bond, Schoeneck & King, PLLC. After hearing from the attorneys, Judge Main denied the application, noting that there did not appear to be a legal basis for the lawsuit filed by the Lake Colby Association. Bill Branson, the President of the Adirondack Railroad Preservation Society, stated: "I am pleased that the Court has denied the application. The Adirondack Scenic Railroad has an outstanding safety record, and is committed to safe operations. I believe that the allegations in the complaint are not accurate. The tracks in question are owned by the State of New York, and are maintained by the Adirondack Railroad Preservation Society pursuant to agreements with the State. Maintenance and repair of the area in question is set to begin next week, and we had no intention of operating over the section of track in question until that work is complete. This work is customary each year after winter weather damages the tracks in certain areas of the line. The lawsuit commenced by Lake Colby Association was accordingly unnecessary. We look forward to completing this work in the near future, and having an outstanding summer season in 2015." The Adirondack Scenic Railroad is pleased to present Rail Explorers USA an adventure company that is offering a new immersive experience through the Adirondack wilderness. Rail Explorers are introducing pedal powered railbikes to the six miles of historic railroad between Saranac Lake and Lake Clear. The railbike journey will take you past streams, across lakes and through forests that few have accessed before. Experience this spectacular scenery in a fun and unique way. Head over and give their page a "like" for more information! This is something that should have been looked at some time ago!